A few months back, when the summer was just getting started and I was probably feeling nostalgic, I had this urge to throw some horseshoes around. 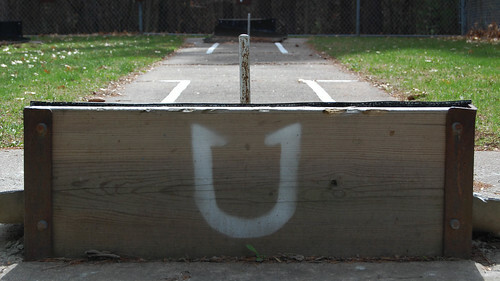 I grew up at VFW Halls, Moose Clubs, and Eagles Clubs, where my dad was a fixture on their horseshoe courts. Since those days, I’ve never pursued horseshoes as a competitive venture, rather just occasionally enjoying it as a purely recreational activity. After speaking with the Lawrence Horseshoe Club‘s organizer, Wynne Mihura, I was encouraged to join them at Broken Arrow Park the following Tuesday. Rain and life kept me from attending for a couple weeks, but once I made it out to the park’s expansive (18) lighted horseshoe courts, I was welcomed and quickly ushered into a crash-course on how to really pitch horseshoes. Apparently, the guys at my dad’s Eagles club had no grasp on the official rules of the game! I was a little intimidated at first. Clay pits are a lot different than the sand/dirt mix I was familiar with! And these Lawrence pitchers are good. Really good. Member Ken Martin recently placed fourth at a World Championship in Iowa. Despite the high skill level, play at the club is friendly and inviting to newcomers. If you don’t own horseshoes, don’t worry – we’ll share.